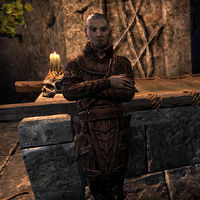 Gelthior is a Bosmer and the cousin of King Camoran Aeradan. He was the one who led the first Blacksap Rebellion. Now that his sons have begun another, he wants to prevent them from getting killed. This page was last modified on 12 October 2017, at 19:22.